The t-shirt forms the basis of pretty much every man's casual wardrobe. I wear t-shirts practically every day. I have ones I wear to work, I have ones I wear around the house, I have ones I wear if I'm going out, I have ones I only wear under things & I have ones I wear just because I love them. There are 3 main essential tees every guy should own. 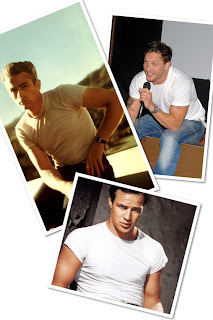 The PWT (plain white tee) This is the quintessential casual icon. Think James Dean, Marlon Brando or today's modern equivalent, Ryan Gosling. A cool piece of kit that goes with anything really. Fit is crucial here. Fair enough, these Hollywood stars have toned physiques and look great in a fitted tee, but remember; tight isn't always right. (A shapeless white t-shirt is also never good). I've bought many white tees, ranging from cheap to over priced. One of the best buys I've found for fit and value is good old H&M. Their plain tees have a good consistent sizing scale- I hate when you buy something in 2 colours and they are completely different shapes and fits. Plus at only £4.99 so you can afford to stock up and replace as you need. You will need to replace as a white tee has to be white. No grubby grey. No stains. Just white. Keep it classic with a crew neck, ensure the sleeves are a good fit & length (no flapping sails at your elbow) and wear it with a pair of dark jeans. Simple. The Polo. Now polos can get a bit of a bad rep as they seem to be the uniform of choice for many work places and rock up somewhere in the wrong colour and you'll be hounded by customers . (Been there, wore the t-shirt). But they are a great versatile piece that has been embraced by many varying style cultures, from preppy to hipster. Look for that something different, this is the whole point of these t-shirts. Go for repeated over-sized patterns, inverted colours, iconic photo images - anything you fancy! A graphic tee is perhaps the easiest way to show your personality in your clothes, but avoid anything with offensive slogans or witty puns. You don't want that much personality.